Our Sorbacal® calcium-based sorbents and their blends offer excellent capture for a wide range of acidic pollutants and micro-pollutants. Besides efficient pollutant capture, the use of the Sorbacal® sorbents results in a large number of benefits for your process. Additional gains are achieved by combining our products with our customized services and solutions for your particular FGT equipment and operation. When considering capital cost of equipment, efficiency of enhanced sorbents, and operational flexibility, most often we can offer the lowest overall cost solution to our customers. In dry sorbent injection (DSI) our enhanced-reactivity products enable efficient pollutant removal without the use of water. This is in contrast with water-intensive systems like wet scrubbers or spray dry absorbers. It makes DSI particularly advantageous in regions with water scarcity. Compared to other FGT technologies, a DSI unit requires limited investment and only a brief downtime for installation. It is a simple add-on to an existing process. A DSI process utilizing hydrated lime consists of blowing a ready-to-use dry powder into a gas stream. Its operation therefore consumes only a small amount of power, as additional milling of the powder is not required. Unlike most other systems, DSI permits rapid dosage modification: from 0 to 100% in just minutes. This enables quick response to peak level changes due to different fuel quality or other process changes. “Peak shaving” increases efficiency and lowers the costs of pollutant capture. This is particularly useful for combined processes, for instance DSI with a spray dry absorber. A DSI system can also easily be switched on and off, a useful feature for power plants with large load swings. Fly ashes can be very corrosive to the fabric of filter bags. In DSI the fly ash is diluted, preventing fabric degradation and reducing costs. Our sorbents are also used to pre-coat the filter bags with a protective layer, further lengthening filter bag life. Our Sorbacal® sorbents can be mixed with activated carbon, activated lignite or Minsorb® for combined acid gas removal and micro-pollutant capture (e.g. mercury, dioxins, furans). In this way only one DSI system is required and costs are reduced. The blends are tailored depending on the customer’s flue gas composition. When acid gases such as SO3 and HCl cool to their dew points in the presence of moisture, very corrosive compounds are created that damage ducts and air pollution control systems. Our highly reactive Sorbacal® sorbents ensure effective capture over a wide range of temperatures, lowering duct corrosion. High-sulfur coal or other primary fuels usually cost significantly less than low-sulfur fuels. The superior reactivity and acid gas capture potential of Sorbacal® sorbents enable the use of fuels with higher levels of sulfur or chloride. This offers greater operational flexibility and improved economics. Ammonia is typically used in NOx control systems using selective catalytic reduction (SCR) or selective non-catalytic reduction (SNCR) technology. In particular, the formation of ammonium bisulfate (NH4)HSO4 or ABS can foul air heaters and electrostatic precipitators. Sorbacal® sorbents used prior to the air heater and ESP remove SO3 and prevent the formation of ABS, boosting efficiency and cutting costs. Selective catalytic reduction (SCR) systems are used to lower NOx in, for example, coal-fired boiler gas streams. Gaseous arsenic released through coal combustion can deactivate the DeNOx catalyst. Adding small amounts of limestone (CaCO3) or quicklime (CaO) to the fuel or DSI with hydrated lime prior to SCR reduces the gaseous arsenic in the flue gas. This decreases its harmful effect on the catalyst, boosting the efficiency of NOx capture and lowering costs. In addition, the minimum SCR operating temperature can also be reduced. Typically, dry sorbents based on powdered activated carbon (PAC) are used in mercury control applications. It is known that SO3 in the flue gas stream increases carbon consumption, as it competes with mercury in the activated-carbon capture sites. Sorbacal® injected upstream of the carbon injection captures the SO3, thus reducing PAC consumption and mercury control costs. When considering dry processes you may want to compare the costs of calcium and sodium sorbents. It is critical to do this on a mass consumption basis. This can be illustrated by contrasting Sorbacal® calcium hydroxide (Ca(OH)2) with trona. For the same molar consumption, the actual consumption on a weight basis is dramatically higher for the sodium sorbent due to the difference in molecular weight: 226 (g/mol) for trona vs. 74 (g/mol) for Sorbacal® calcium hydroxide. By estimating the sorbent cost on a weight basis, the actual sorbent cost-per-ton of acid gas captured may be calculated. Unlike Sorbacal® calcium hydroxide (Ca(OH)2) sorbents, most sodium sorbents – for example sodium bicarbonate – typically require on-site milling, which is necessary to produce sufficiently fine powder for flue gas treatment. An on-site mill adds capital, power, and maintenance cost to the flue gas treatment process. The use of sodium-based sorbents produces sodium sulfate, which is very soluble. By contrast, Sorbacal® calcium-based products create less-soluble calcium sulfate. The resulting fly ash may comply with leaching limits, enabling its use in soil stabilization and increasing its resale value. Moreover, high sodium content in fly ash may prevent its use in cement and concrete applications. We provide sorbents with the highest purity and whiteness. The higher whiteness increases the resale value of the gypsum generated from wet scrubbers. Compared to standard hydrates, the high performance of our Sorbacal® sorbents lowers consumption. This generates fewer residues and has a positive impact on the direct and indirect operational costs of flue gas treatment. Because of the high performance of Sorbacal®, the refill frequency of the silo is lower than with standard sorbents. This optimizes logistics and allows a silo with a smaller volume. The high performance of Sorbacal® SP and SPS means consumption is significantly lower than that of standard hydrates. This results in a slower build-up of residue in the filter sleeves and thus less-frequent filter cleaning. The reduced stress on the filter sleeve materials significantly increases their lifetime. Our Sorbacal® products are highly effective in capturing HCl from the flue gas. Injecting Sorbacal® sorbents before a wet scrubber results in an increased chloride capture, and therefore reduced wet scrubber blowdown. Removal of heavy metals (e.g. selenium, arsenic) from the waste water of wet scrubbers will become a future topic for utility operators. Dry sorbent injection (DSI) of Sorbacal® SP or SPS is very effective in removing selenium (SeO2) and arsenic from the gas phase. Injecting Sorbacal® SP or SPS upstream of the electrostatic precipitator (ESP) will reduce the selenium concentration in the wet scrubber waste water and may eliminate water treatment. A DSI unit is technically a simple system consisting of a silo, dosing unit, blowers and in-duct injection lances. It therefore requires only a small footprint in the existing plant. The high pore volume and surface area of our Sorbacal® SP and SPS sorbents make them much more efficient at acid gas removal than standard hydrated limes. Laboratory tests, pilot scale demonstrations and commercial experience all show that Sorbacal® SP can be twice or more as active as standard hydrated lime. This reduces the fresh sorbent by at least half and also generates fewer residues (see illustration). For the same 80% SO2 removal, the dosing rate of our Sorbacal® SP enhanced hydrate is less than half that of Sorbacal® H, our premium standard hydrate. 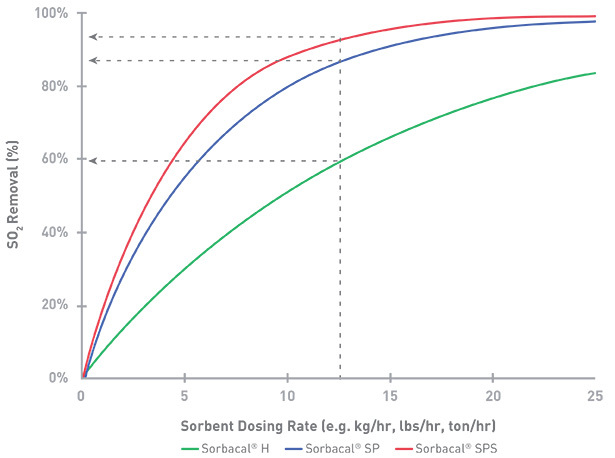 Sorbacal® SPS is even more efficient, leading to an even lower dosing rate compared to Sorbacal® SP. The curve depends on the operating conditions and gas composition. Our experts can simulate performance curves representing your specific application in order to calculate the Sorbacal® sorbent consumption. The graph shows different dosing rates for the same SO2 removal. The high pore volume and surface area of our Sorbacal® SP and SPS sorbents make them much more efficient at acid gas removal than standard hydrated limes. Sorbacal® SP can be twice as active as standard hydrated lime. This enables to reach tighter emission limits than with standard hydrate. 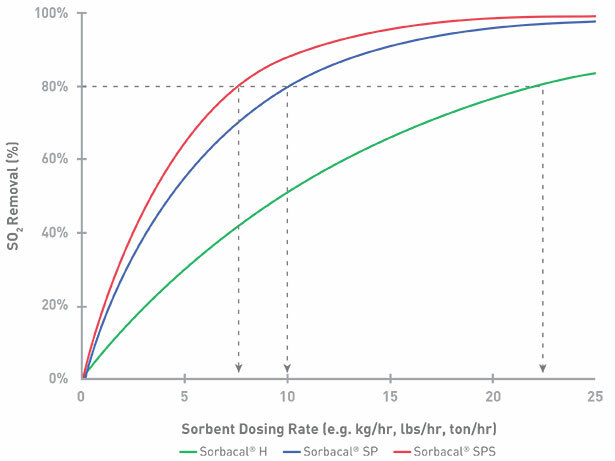 For most applications Sorbacal® SPS is about 30% more active than Sorbacal® SP, and thus capable of achieving even tighter limits (see illustration). For the same dosing rate our Sorbacal® products provide different levels of SO2 removal efficiency. Tight emission limits cannot be achieved with regular hydrated lime sorbents and will require highly active sorbents like Sorbacal® SP or SPS. In some processes the intake air is pre-heated with flue gas. If the flue gas contains sulfur trioxide (SO3) and too much heat is transferred from it, sulfuric acid can form. This leads to air-heater corrosion. By injecting our sorbents before the air heater the SO3 can be captured, eliminating the risk of sulfuric acid formation. This enables deeper energy recovery, boosting energy efficiency and lowering greenhouse gas (CO2) emissions. Unlike most other systems, DSI permits rapid dosage modification: from 0 to 100% in just minutes. This enables quick response to peak level changes due to different fuel quality. “Peak shaving” increases efficiency and lowers the costs of pollutant capture. This is particularly useful for combined processes, for instance DSI combined with a spray dry absorber. A DSI system can also easily be switched on and off, a useful feature for power plants with large load swings. In a DSI process the flue gas temperature is not affected, enabling higher heat recovery and increased process efficiency. Our optimized particle size is small enough for high reactivity, yet large enough for efficient particulate removal in electrostatic precipitators (ESPs). In bag filters our particle size prevents a too-high pressure drop. This avoids higher power and maintenance costs and shortened filter-bag life. Additionally, optimized particle size means that our products are engineered for good flow behavior, minimizing transportation issues in the silo and dosing systems. This reduces the risk of exceeding emissions limits due to a clogged system, and lowers operational and maintenance costs. Sorbacal® SPS has a higher electrical conductivity than regular hydrated lime, as well as an optimized particle size. This makes the product compatible with electrostatic precipitator (ESP) systems. The high reactivity of SPS leads to better SO2 control without increasing particle emissions from the ESP. Our highly reactive Sorbacal® sorbents require lower consumption for a given acid-gas capture rate. This reduces the filter load and therefore particulate emissions. Selective catalytic reduction (SCR) systems are used to lower NOx in, for example, coal-fired boiler gas streams. But gaseous arsenic released through coal combustion can deactivate the DeNOx catalyst. Adding small amounts of limestone (CaCO3) or quicklime (CaO) to the fuel reduces the gaseous arsenic in the flue gas. This decreases its harmful effect on the catalyst, boosting the efficiency of NOx capture and lowering costs. In addition, the minimum SCR operating temperature can also be reduced. Typically, dry sorbents based on powdered activated carbon (PAC) are used in mercury control applications. It is known that SO3 in the flue gas stream increases carbon consumption. Sorbacal® injected upstream of the carbon injection captures the SO3, thus reducing PAC consumption and mercury control costs. Sorbacal® SP and SPS are very effective at removing SO3 in flue gas. Injection of Sorbacal® SP or SPS prior to a selective catalytic reduction (SCR) unit lowers the risk of ammonium bisulfate formation. This allows the SCR to operate at a lower temperature, which increases the catalyst lifetime. Some sodium-based sorbents will emit NOx during their reaction in the flue gas. These nitrogen oxides can adsorb on the surface of powdered activated carbon (PAC) thus reducing their efficiency for mercury capture. Sorbacal® sorbents will not generate NOx in your installation. Unlike most other systems, DSI permits rapid dosage modification: from 0 to 100% in just minutes. This enables quick response to peak level changes due to different fuel quality. “Peak shaving” increases efficiency and lowers costs of pollutant capture. This is particularly useful for combined processes, for instance DSI with a spray dry absorber. A DSI system can also easily be switched on and off, a useful feature for power plants with large load swings. The injection of powdered activated carbon (PAC) can result in hot spots in the bag filter. It may also require special explosion-proof storage and dosing equipment, for example to comply with the European ATEX directive. Our blends of Sorbacal® and PAC mitigate the risk of explosion and fire. Lhoist DSI products are engineered for good flow behavior, minimizing transportation issues in the silo and dosing systems. This reduces the risk of exceeding emissions limits due to a clogged system, and lowers operational and maintenance costs. Find the best solution for your business by contacting one of our local experts.